Ingredients: 8 pieces of guava leaves are still fresh. and then filtered to take water. How to use: drink 3 times a day, morning, afternoon and evening. water is ingested and waste is disposed. water until boiling and then filtered to take water. powdered fried rice with no oil (couple = Java). cups water to boil down to 1 cup and then filtered. Ingredients: 1 handful of guava leaves, 1 slice of guava bark. How to use: to rub the skin of the sick. Guava (Latin: Psidium guajava) belonging to family Myrtaceae, spread extends to Southeast Asia including Indonesia, to South Asia, India and Sri Lanka. Guava plants, including shrubs and has many branches and twigs; hard trunk. 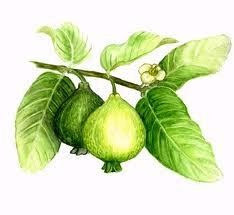 Surface of the outer skin of the guava tree is brown and smooth. If the skin is exfoliated guava wood, stem wood surface should look wet. The shape is generally patterned oval leaves with a rather large size. The flowers are small white and leaves emerge from behind the armpit. These plants can flourish in low-lying areas until at an altitude of 1200 meters above sea level. At the age of 2-3 years has begun to bear fruit guava. Seeds many and there in the flesh. Chemical Ingredients: Fruit, leaf and guava tree bark contains tannin, the flowers are not many contain tannins. Guava leaves also contain substances other than tannins, such as essential oils, acid ursolat, psidiolat acid, acid kratogolat, oleanolat acid, guajaverin acids and vitamins.